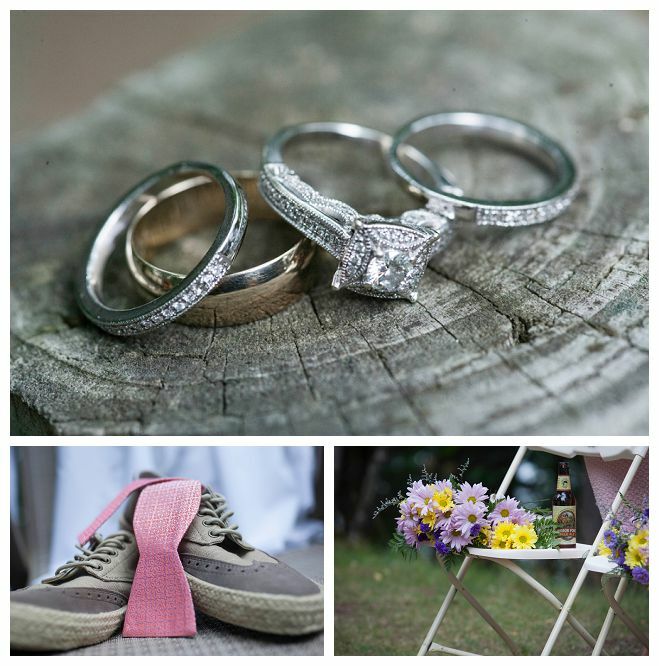 We wanted the day to reflect a casual, romantic, fun feel with an emphasis on the outdoors. We chose to get married at Black Bear Lodge, because it is near where we met. We love the large trees that cover the grounds, and wanted abundance of activities for our guests, most of whom were staying the weekend or longer because of the drive. The northwoods has been a favorite spot for my family, and one that is now dear to Paul, too. Small evergreens, reminiscent of the large, towering trees at Black Bear, were chosen for the centerpieces and favors, and the tables were labeled with small white arrow signs and finished with candles floating in clear vases layered with small river rocks. Paul and I also spent our weekends leading up to the wedding handcrafting large white arrow directional signs for the roads, grounds, and check-in office. We felt like pros by August! 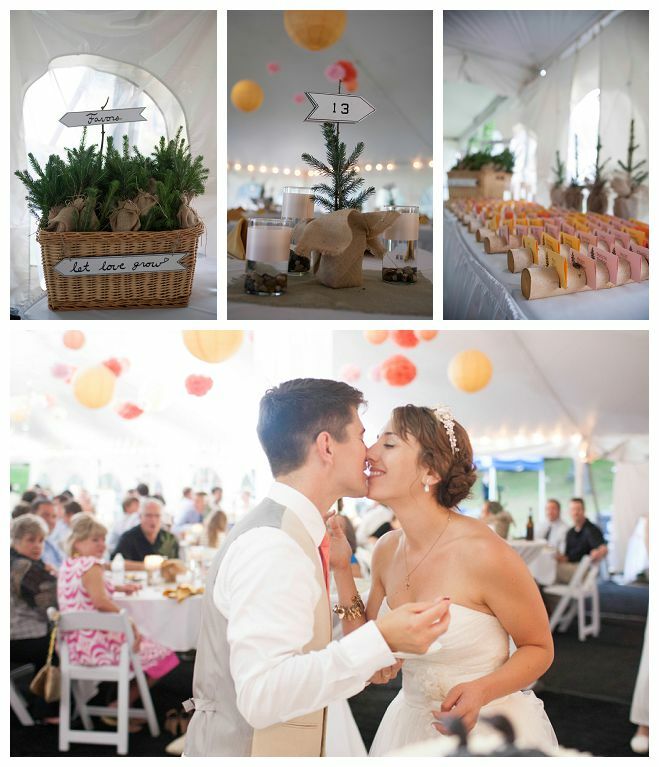 Although we put the most thought and effort into the reception--Paul and the dads worked on the tent ceiling decor for about 10 hours, and the moms and I worked on the tablescapes and other tent details--the ceremony ended up being my favorite and most memorable part of the wedding. 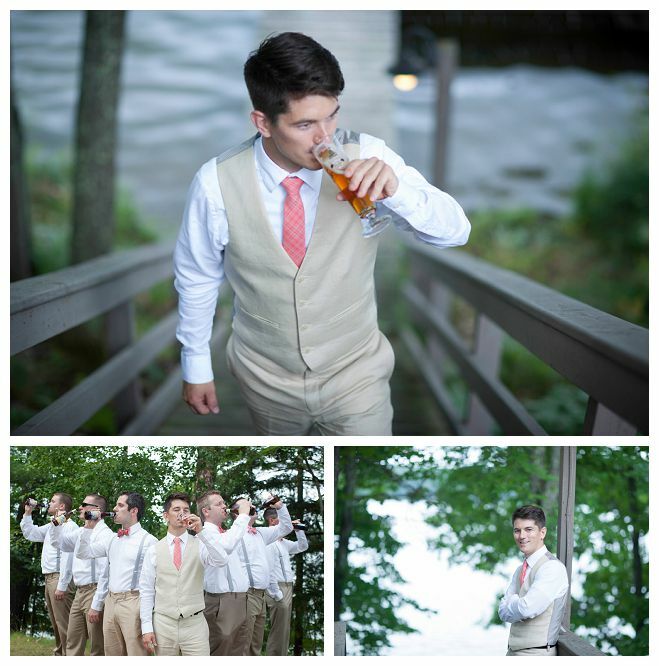 Our friend and officiant, Jason, did an outstanding job of personalizing the ceremony. He included pieces of us we didn't know he knew. 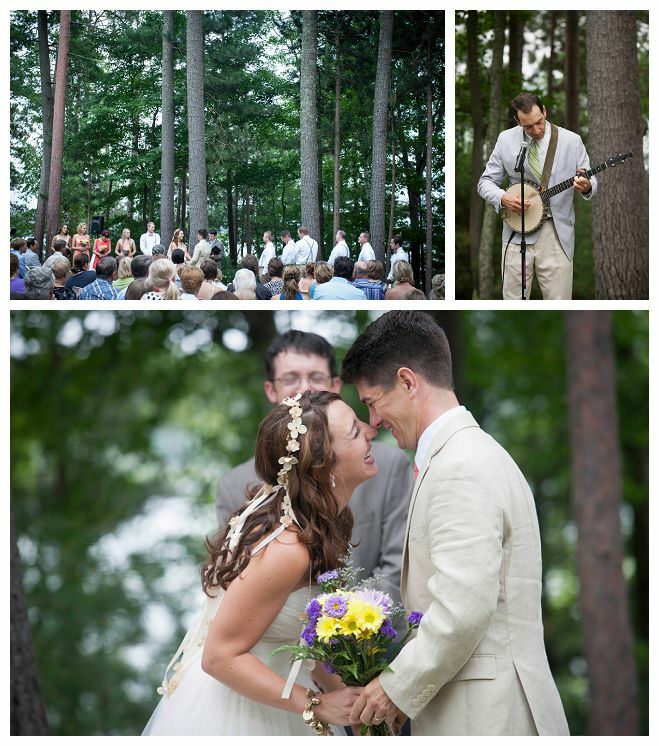 From walking down the isle, to the reading, to the music, almost everyone was in joyous tears. And as we exchanged our vows, two bald eagles nesting nearby encircled the ceremony overhead. Completely magical. The most relaxing part of the day was taking pictures with Matt and Krista from Fornear Photo. We were married(! ), so all the moving pieces that were critical had come together, and now we just got to be with each other and our good friends, and celebrate this momentous day. We got to kiss without interruption, even with encouragement! The reception was a blast--a big party, just as we'd hoped. After the grand entrance, we went straight into our first dance where we sang to each other the whole time. The beers and wines we chose were a hit--hard to go wrong with Two-Hearted ale--and our signature cocktail (a bourbon lemonade concoction my mom made up the summer before) was none too sweet or boozy, and very drinkable. 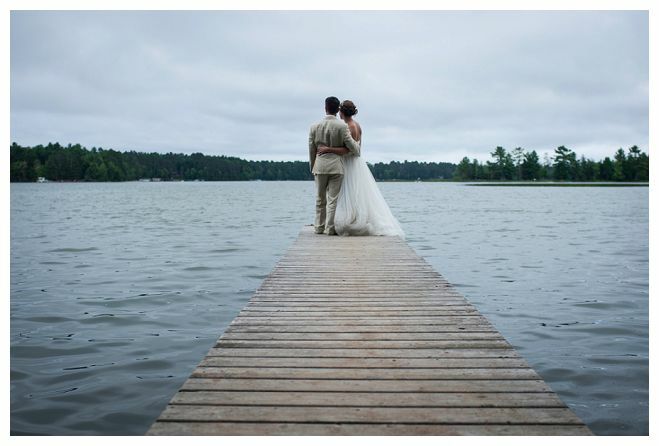 After the reception and after-party at the bar, Paul and I went back to the cabin, changed out of our wedding wear, and took a 2am swim in Little St. Germain Lake. 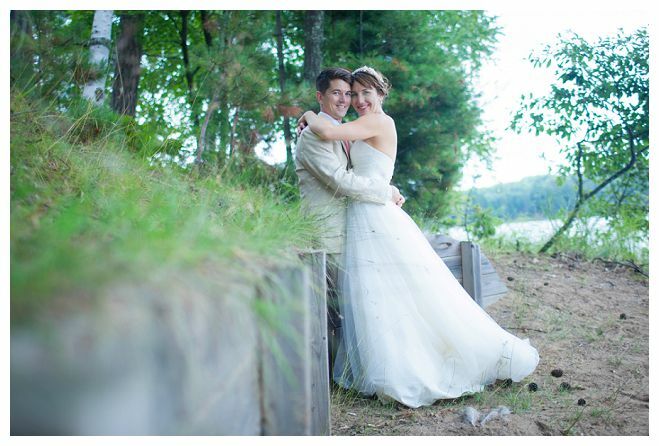 It was the perfect end to a very northwoods wedding. Overall, the day reflected us perfectly and was better than I could have ever dreamed!